Following last week's terrible news that Telltale Games has let most of its employees go as part of a "majority studio closure", there's been a lot of discussion about the games that have been canned in the midst of that. While the emphasis of this should obviously remain on the 250 employees suddenly losing their jobs, it's understandable that players are also curious about the fate of the games that were still under development by Telltale. One of those games is Stranger Things, based on the hugely successful Netflix series, and first announced back in June. We reported yesterday that Netflix still wants a game to go ahead and, in a statement, said that they'd look for "other options." But it seems we may have a glimpse at how Telltale's game would have looked, thanks to video clips leaked on Reddit and 4chan. As PCGamesN reports in collecting these leaks, though, there's no way to verify if these are the real thing or not, so keep that in mind when you watch these. 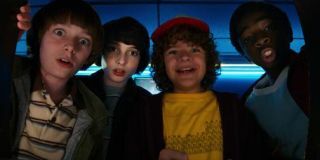 The videos below show a variety of different scenes, including Will exploring the Byers home and going through a drawer, as well as a Demogorgon, seemingly in the first-person viewpoint of the Upside Down. Once again, we can't be sure if these are the real deal or not, but they're worth a look.